but they are coming from a place of experience in food and design. Anytime after this next Monday. Just give a shout. Eventually, this August, I got a chance to visit MKS proprietor Adam Simha's studio, see where the knives happen, and get the heft of one. I've been living with his red-handled 10" Chef's since. This is, make no mistake, a big knife. It weighs more than twice as much as the 8" Wusthoff which is my regular utility knife. A side-by-side comparison also shows that the configuration of the MKS is different. My concern about the bike grip handle, which is what spurred the initial comment, turned out to be unfounded. One could, if one chose, hold the knife by the handle as if it were attached to the handlebar of an Schwinn, but you'd have no more control than if you grabbed any knife thus. But a standard chef's grip is comfortable -- the bike grip looks cool, and does the job as well as a more conventional grip. These knives certainly look cool, but for the hefty price tags, they had better be more than flair for the on-beyond-Design-Within-Reach set, and they are. If you imagine a continuum that begins with the crappy Ginsu style stamped and microserrated knife you had in college, and continues to the Henkels/Wusthofs/Globals you get for being a monogamous heterosexual, the MKS is the next stage. This has its upside and its downside. The Ginsu requires no maintenance, in fact cannot be sharpened, and delivers a consistently mediocre cut. The Crate and Barrel stratum of knives cut better, but require steeling and occasional sharpening. The MKS blade is actually softer than a Wusthoff, which means it gets duller faster than the Wusthof or whatever. The good news is that it also gets sharper faster. Big Red Chef came in a roll with a diamond steel and a strop, and the difference these make between sharpenings is dramatic. The steel works like any steel, but the MKS responds to it more quickly than a harder knife would. The strop, which I had not used before, looks just like the strop a barber uses, and has a similar function. After steeling, you can see the tiny wire bead created by steeling come off on the leather. The MKS outperforms Wusthoffs, et al, but requires more TLC. The minimal TLC of steeling and stropping is worth the effort. The size of the knife made me think initially I'd save the Big Red Chef for when I needed to lop a bar of iron in half to impress some Saracens, Richard the Lionhearted steez, but I've found the knife such a consistent pleasure to use that I find myself using it even for things like peeling a head's worth of garlic cloves. The length and the balance of the knife makes it like having two knives in your hand at once -- closer to the handle, the depth of the blade gives you the power to dismantle a whole pig, while closer to the tip, you have the finesse to bisect a bunch of cherry tomatoes for a salad. As Simha confided to me off the bat, these are not for everyone. However, if David Kamp is to be believed, there are many such cooks, and I imagine they would cherish this knife. You sort of elide the question of whether you bought the $225 knife, received it as a bloggable promo item, or have it on loan. Also, your two "however" clauses at the end threw me for a loop. However, it looks like a nice knife. If I didn't have a cutlery glut already, I'd try one out. What exactly is the next-level advantage of the MKS besides its weight? 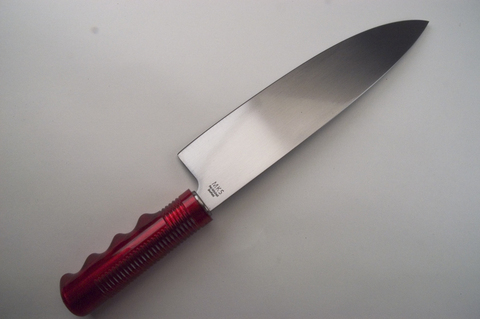 I just weighed my deeply patinaed old 10" carbon steel Sabatier: 15 oz., the same as your red guy. Interesting that nobody seems to have designed a handle with the pinching "pro grip" in mind.